In need of an adventure and a respite, I googled “Cheap Pilgrimages.” El Camino de Santiago de Compostela was toward the top of the results: a 500-mile foot pilgrimage across northern Spain. For the time involved, it sounded (relatively) cheap and adventurous. Just what I was looking for! I started making plans. My plans didn’t include any research or training. 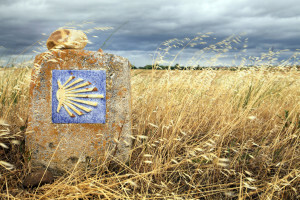 At the time, the Camino wasn’t well known in the US (Shirley Maclaine and Martin Sheen have done much to change that in recent years) and the weeks prior to the trip were filled with the tasks of running an active and growing nonprofit and handing off leadership for an extended time. I bought a guidebook and figured I would read it on the plane to Europe. When I arrived at the train station near the border of France that marks a traditional starting place for the journey, I was wearing tennis shoes, jeans, and had a bulging backpack with several things tied to the outside. With one look at the trainful of German hikers with tiny packs, professional walking sticks and the perfect hiking clothes, I had a moment of sheer panic. My complete and utter ignorance was suddenly evident. My first days were spent evaluating the contents of my pack and leaving items behind at every stop. I mailed myself a package to “General Delivery” to a post office at the end of the trip, items that I couldn’t bring myself to abandon. The kindness of the Camino was shown to me as people helped me tend to my blistered and aching feet. I started to find a groove, both with the walking and the long stretches of silence. The silence occasionally turned to prayer. There is much to be said about my time on the Camino. But, one of the core lessons was coming to love the interplay of “now” and “not yet”. I spent day after day walking, following the mostly dirt path marked by shells and yellow arrows and creating a place to rest in whatever circumstances I found myself in at the end of the day. Some days had familiar faces from past encounters and extra blankets at night; others were marked by arduous mountain climbs and awkward bathroom arrangements. As pilgrims from across the world, we had little in common with each other, bound together only in the decision to walk. My “now” was the path ahead of me, the people who were with me that day, and the decision of when to stop. My “not yet” was the city of Compostela. As the ending point, it was always on my mind. I was afraid that I wasn’t going to make it in time to catch my return flight and towards the end, I recalculated every day. I was curious about what it would feel like to be done–would I be relieved or disappointed? I wasn’t sure. I was looking forward to reclaiming my jeans and a pair of sandals at the post office and shopping for souvenirs without the burden of having to lug them across Spain. My “now” is Washington, DC. I’m here but know that it’s a place of transition, a place in between. There are a few people who have accompanied me who I will treasure and a blur of faces who I won’t remember. Again, I have too much stuff and have relied on the goodness of others to tend to my little aches. And slowly, I have found my groove. The “not yet” is a bit fuzzy. Heaven lingers out there as the capital-H Home that is “not yet.” Prior to that final destination (God-willing! ), there is road to travel, a road with prolonged stops, I suspect. 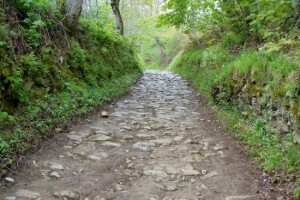 Some of the same Camino questions arise in my heart: will I get where I am supposed to be? how will I feel when I arrive? will I remember the little moments that got me there? will I create a place that I know, without flinching, is my home? Until those answers arise, I just keep walking. This entry was posted in Home & Place. Bookmark the permalink.